As the civil war in Syria rages on, millions of Syrians have lost their loved ones, home, income and security. In addition to these enormous challenges, many Syrian girls also face the danger of underage marriage. Many Syrian parents, often in a dire financial situation, feel forced to marry off their daughters, or see marriage as the only way to protect their daughters from sexual harassment and violence. Fundamentalist groups like ISIS and Jabhat Al-Nusra encourage underage marriage as being in line with Islamic sharia law, and often force young girls to marry their fighters. Although exact numbers about the situation in Syria itself are not available, a sharp increase of child marriage amongst Syrian refugees in Jordan was reported: from 12% of all registered marriages in 2011, to 25% in 2013 and even 32% in early 2014. Once the girls are married, they often no longer go to school, get pregnant at an early age, and end up in social isolation. They are forced to grow up very fast with few perspectives of further education or independence. On January 12, 2015, Hivos’ Syrian partner organisation Saiedet Sourya started a campaign against the marriage of underaged girls in Syria. By raising awareness about the many dangers marriage poses for these young girls, they hope to counter this development and to make sure that Syrian girls are protected from bearing responsibilities that are not supposed to be part of their childhood. Saiedet Sourya participates in Hivos’ Women on the Frontline Programme. Hivos opposes underage marriage, and fully supports the right of every child to enjoy a safe and secure childhood. 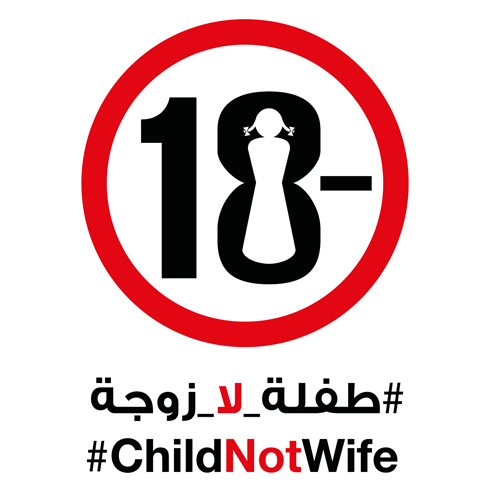 If you also want to support this campaign, you can post a photo of yourself while holding the campaign’s logo and tweet it along with the hashtag #childnotwife, or send it to Childnotwife (at) gmail.com, after which your photo will be placed on the campaign’s facebook page (Arabic).